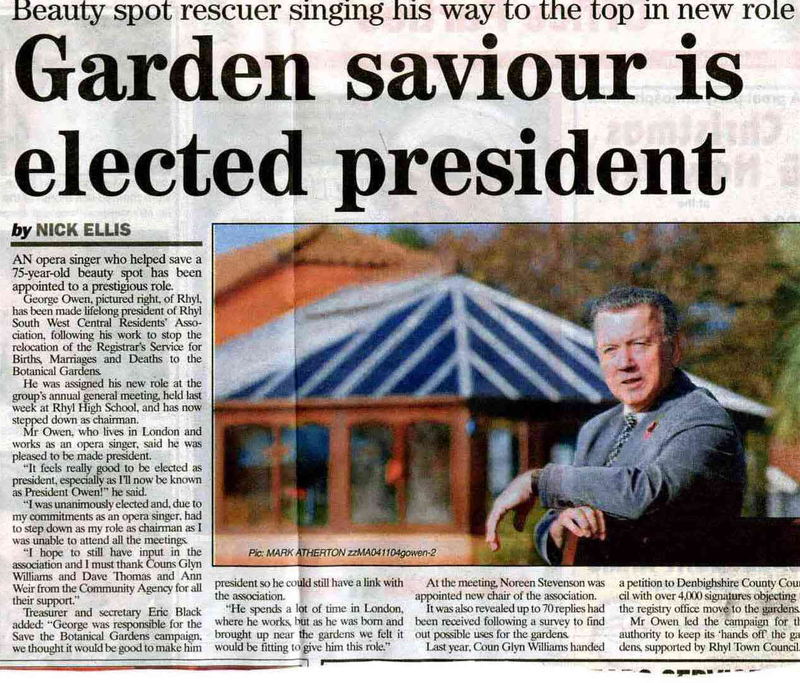 We recently featured the Botanical Gardens on our site and as a result we have heard from Mr George Owen, President of the Rhyl South West Central Residents Association (incorporating Save the Botanical Gardens Campaign). The association organised a vigorous campaign and petition against a plan to relocate the Register Office to the Gardens. 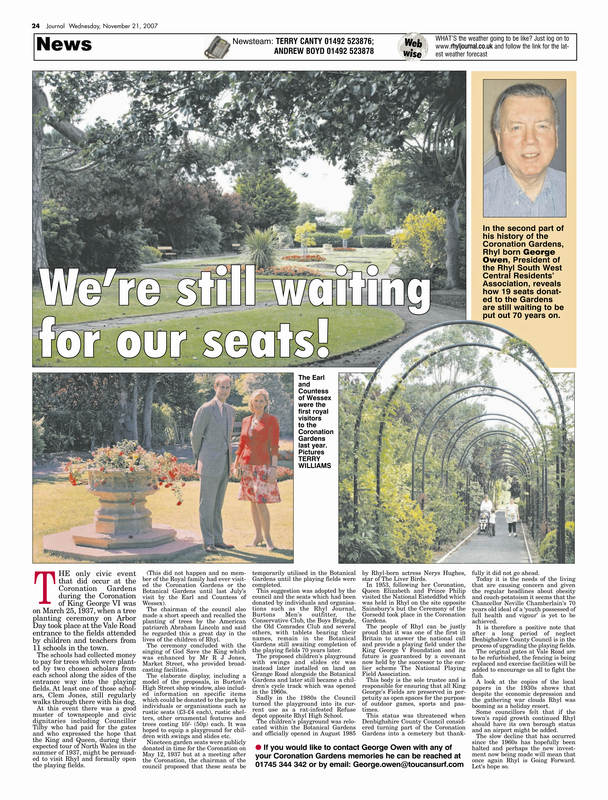 In 2007 George wrote a series of articles about the Botanical Gardens and the Coronation Gardens, parts of which are reproduced below. Click on the image to enlarge. Reproduced with permission of Mr A. Martin, Editor, Rhyl Journal. “The origin of the Coronation Gardens/King George V Playing Fields in Rhyl dates from the late 1930s. In March 1936 an appeal for funds was launched in aid of a National Memorial to King George V who had died on 20 January, 1936. The form of the memorial was to be the provision of playing fields for young people and children. 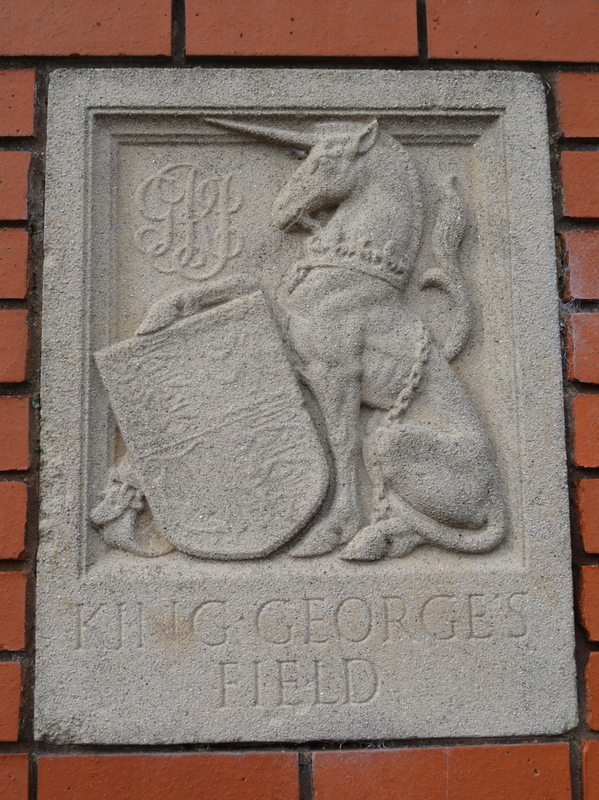 On November 3, 1936, King George’s Fields Foundation was constituted by Trust Deed “To promote and to assist in the establishment throughout the United Kingdom of playing fields for the use and enjoyment of the people, every such playing field to be styled King George’s Field and to be distinguished by heraldic panels or other appropriate tablet medallion or inscription commemorative of His Late majesty and of a design approved by the Administrative Council”. By 1946, 471 such fields had been created – Rhyl’s was one of the first. Rhyl Urban District Council (RUDC) enthusiastically took up the fitness challenge, as advocated by Prime Minister Neville Chamberlain, and plans were soon in hand to provide playing fields as an extension to the Botanical Gardens in Grange Road. All this activity coincided with the Coronation of King Edward VIII planned for May 12, 1937 and initially the town’s new playing fields were to be called the “King Edward VIII Gardens and Recreation Ground”. However, the new King’s personal problems intervened and Edward’s romance with Wallis Simpson put paid to that title when he abdicated and left with her for France on December 11, 1936, so the gardens finally had two names. 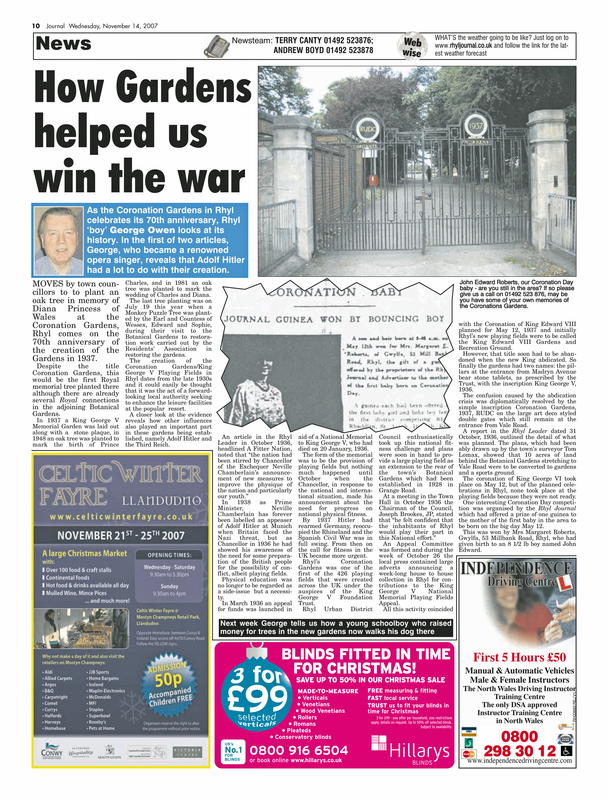 The entrance from Madryn Avenue bears two tablets, as prescribed by the Trust, with the inscription King George V, 1936, and the confusion caused by the abdication crisis was solved by the simple inscription “Coronation Gardens, 1937, RUDC” on the large art deco double gates at the entrance from Vale Road (see photo in newspaper page above). 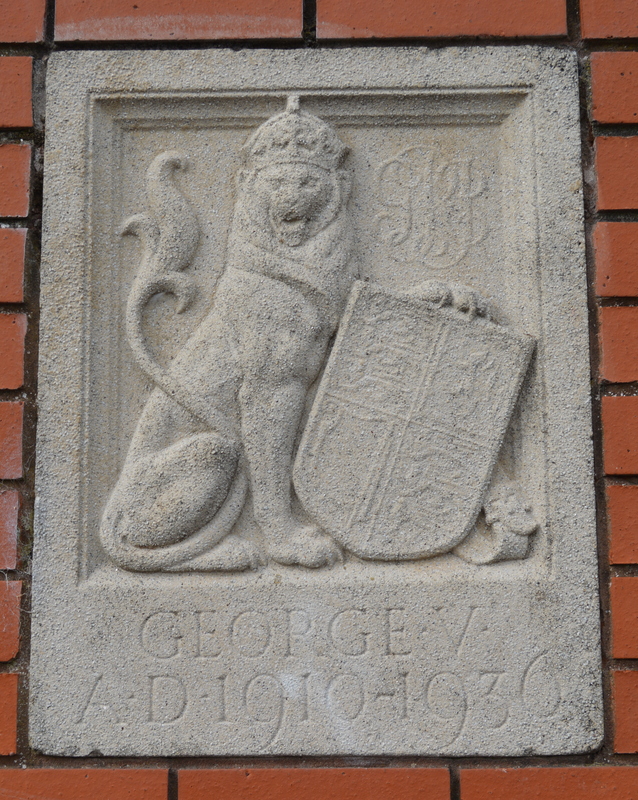 The Royal uncertainty and the need to get the work done meant that the name of the new King, George VI, didn’t feature. Of the two names Coronation Gardens is the name which soon entered the local vernacular or, more commonly among youngsters, “the Corras”. 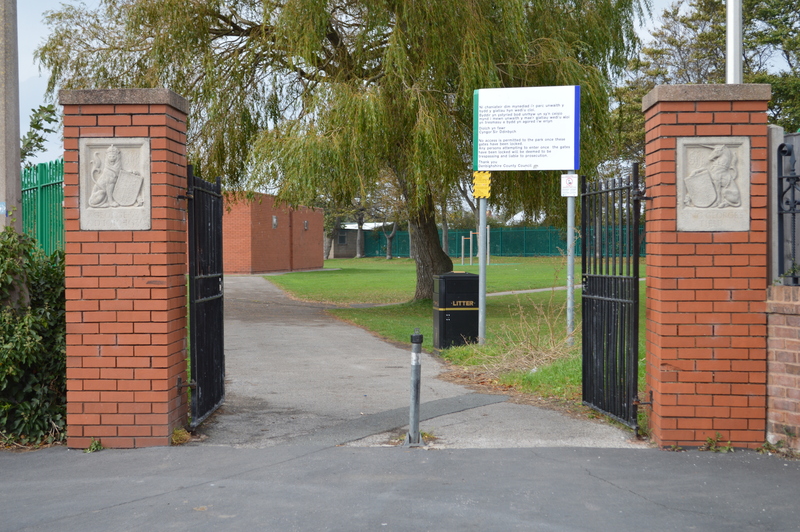 Entrance to the Coronation Gardens from Madryn Avenue. Click to enlarge image. Reproduced with permission from Mr. A Martin, Editor, Rhyl Journal. 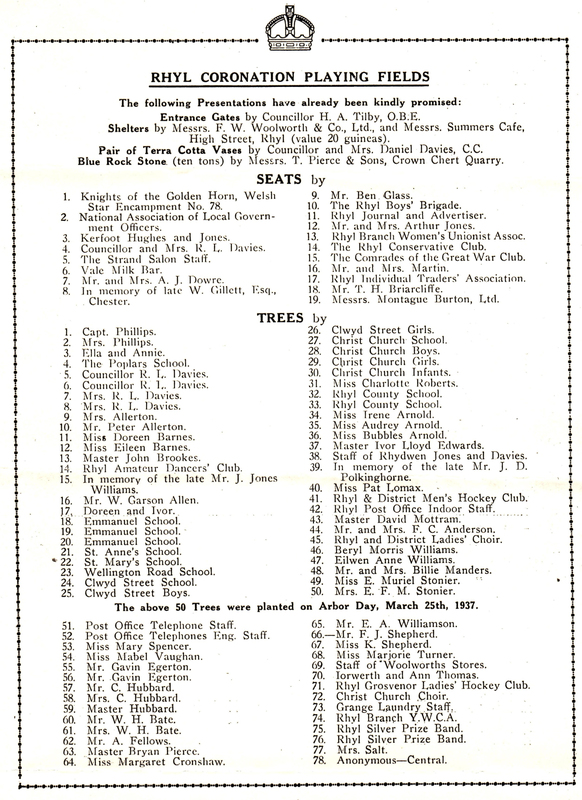 The 1937 list of donations includes those who donated the wooden benches. Many are still in place around the Botanical Gardens still displaying the plaques showing who donated them. When the Coronation took place seven months later on May 12, of the planned celebrations in Rhyl, none took place at the Playing Fields because they were not ready. It was hoped to equip a playground for children with swings and slides etc. These, plus a Bandstand, were to be placed in a separate two-acre Garden of Remembrance dedicated to George V. However, once the completion deadline of the May Coronation was missed the urgency of completing the rest of the playing fields gradually faded and a more modest scheme than that first planned was completed over a longer period. The grand playing field scheme as originally envisaged in 1936/37 did not quite materialise and WWII was soon to divert some attention from such schemes. The playing field has always been a large open space used mainly for ball games such as football, cricket and hockey. Thanks to George Owen for this contribution.